Companies have to connect with their customers if they want to succeed in today’s marketplace, according to a survey commissioned by rbb Public Relations. Make consumers fall in love, and they’ll even pay more for your products. Think of the lines outside of Apple stores when a new product is released. The survey, conducted by polling firm IBOPE/Zogby International, indicates that 83% of consumers are willing to pay more when they feel a personal connection to the company. Of the 2,000 adults surveyed, one-fifth said they would pay 50% or more if they felt the company put the customer first. Questions focused on a newly identified evolutionary marketing strategy that nullifies the traditional challenger brand approach. The PR company has named it the “breakout brand” strategy. Breakout brands make the customer their first priority rather than chase their competition. The survey’s list of the top 10 breakout brands includes: Apple, Amazon, Chick-Fil-A,Wal-Mart, Costco, Starbucks, Google, Zappos, Toyota, Ford, Trader Joe’s and Southwest Airlines. Examples are illustrated in rbb’s white paper outlining the strategy and include: Why being a good company isn’t enough, what it takes to become a breakout brand like Apple and why positioning for market share from your competition will render stale results. 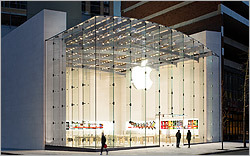 Of the companies included in Fortune Magazine’s Most Admired Brands in 2012, Apple and Amazon were the only two considered breakout brands by more than half the people surveyed. The research indicates that breakout brand companies share a common strategy. They deliver services and products that trigger a response, an emotion, and a reaction from customers. Consider Zappos.com with its free return policy backed by a fun-loving customer service approach that delivers “happiness.” Or the anticipation coffee drinkers feel for Starbucks’ limited edition menu options, like the Pumpkin Spice Latte or Peppermint Mocha that signal the arrival of the holidays.